Can Asthma Relief Provide New Gout Medicine? Introducing new gout medicine ideas from existing asthma relief meds, for helping gout pain relief with indomethacin. New gout medicine ideas can be found in many different places. Today, I look at how montelukast, an anti-inflammatory asthma treatment might also help gout sufferers. Before I begin, I must point out that this is a very early look at the potential for an existing asthma relief to assist gout pain relief. The investigation is based on induced gout in mice, and is far from the stages of being an accepted gout treatment. If trials on people are ever introduced, I will provide further information on my reference pages for new gout medicine. At the moment, this is only a potential for further research. Furthermore, it is only aimed at pain relief, and your treatment plan should focus on uric acid lowering treatment, with some provision for pain relief during the first few months. Once uric acid lowering has been successful, there is no further need for pain relief, so you will not need the potential benefits featured in this article. Earlier this year, scientists in Venezuela investigated the effects of montelukast on gout . They explained that indomethacin reduces inflammation as a COX inhibitor. However, there is another type of inflammation associated with gout, the lipoxygenase pathway, and indomethacin has no effect on that. Montelukast, which is commonly used to relieve asthma, inhibits lipoxygenase activity which blocks the synthesis of leukotrienes – molecules that trigger swelling and inflammation. The investigation shows that montelukast appears to have a better anti-inflammatory effect in gouty arthritis compared to indomethacin. Moreover, the combination of both treatments is even more effective. We must remember that this experiment uses mice that have gout induced by artificially depositing uric acid crystals. I am not aware of any human trials, but if they do start, I will monitor the progress and report back to you. Following a comment from Dave, below, I’ve flagged this article for review. 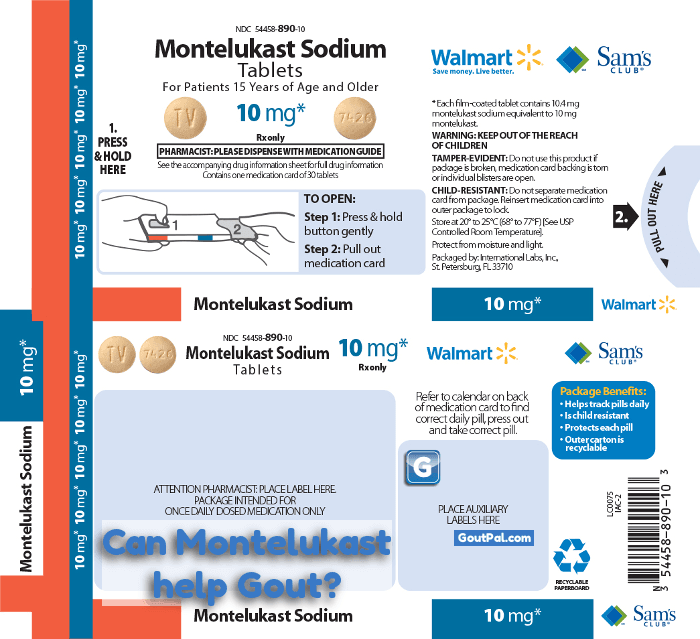 Do you have questions, experiences, or opinions about montelukast for gout? Please, add your thoughts to the Montelukast and gout discussion. Sep 01, 2011 (first archive). First Published. I’ve had chronic asthma for years – last year I was prescribed Montelukast in addition to my preventative steroids. Recently I had a first gout attack- far too much beer and meat in Germany.. I could stand the pain and even walk a bit until I got to the Doctor at home for colchicine, it quickly went down . A second attack subsided very quickly likewise. Age 65 weight 265 lbs. I credit Montelukast from my unscientific experience as a beneficial drug for gout. Gout patients are always looking for better ways to control gout pain, until they can get uric acid under control. I think many people will be interested to see if there are any developments in researching montelukast for gout. I’ve flagged this page for review. People can add their ideas about improving this page at Montelukast and gout discussion. If anyone wants personal advice about montelukast and gout, please start your new topic in the gout forum. You can use that same link to get personal help on any aspect of your gout.